Lock in a great price for Colinas del Miravalles – rated 9 by recent guests! This is a family operation. You can tell a lot of pride goes into keeping it running smoothly. The grounds and setting are stunning! Absolutely beautiful family owned spot! Spent a whole day just lounging in the pools on the property and great to come back from a day trip and relax in in the evening. The staff were amazing and so helpful as we were travelling with our 5 month old. Bungalow 1 has a little private hot tub in the back too. Food was also great. What a beautiful place 😍 views are amazing ! Family owned and they are great ! Highly recommend this little gem ! Very friendly people very clean place and grounds are spectacular! We spent two wonderful days at this unique hotel. Carlos at the check-in desk was so welcoming and helpful during our stay. His family owns the hotel and everyone works there and are all so friendly. 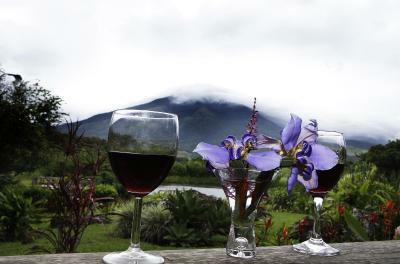 We had delicious breakfasts and dinner in the dining room with a view of the volcano. 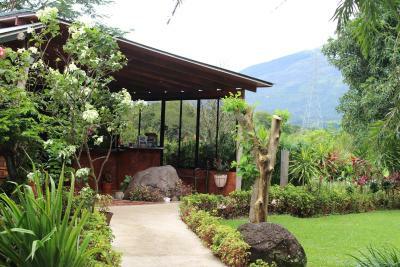 The grounds are beautiful and we were so relaxed spending time in all the different pools all with views of the volcano. The cabins are large and well maintained. We would definitely come back and we recommended Colinas del Miravalles to our friends. This was an amazing place to relax and enjoy the beauty of nature and the hot springs pools. There were lots of walking paths and unique vegetation. It was a quiet and peaceful place. The family that managed the business were very helpful and accommodating. The food was tasty, healthy and very reasonably priced. If you ate looking for a romantic getaway, or a place to gather with a group of friends or family, this is an excellent choice! Clean, comfortable, relaxing. Great views of Miravalles. Hot springs were rejuvenating. Perfect spot to unwind, family-owned, and good access to area attractions - ziplining, hiking, tours, etc. Will come again. We arrived and felt welcomed once on property! It’s an easy drive to surrounding villages and area attractions. We settled right in for a few days and took advantage of the hot spring pools right on site! Their main dining area was close by and offered a nice setting to enjoy some authentic and tasty dinners and breakfasts! I believe they really try to source everything they can from their property or nearby farms! We also enjoyed the quietness, despite their being some other guests, also with children, and a steady stream of day use guests....overall, a great stay and experience! The bungalow was very spacious and clean, with a hammock and a rocking chair outside. The hot spring pools were nice, surrounded by nature and with views to the volcano. Family style, very friendly. Beautiful scenery. Felt very relaxed and safe. Loved the hot springs. 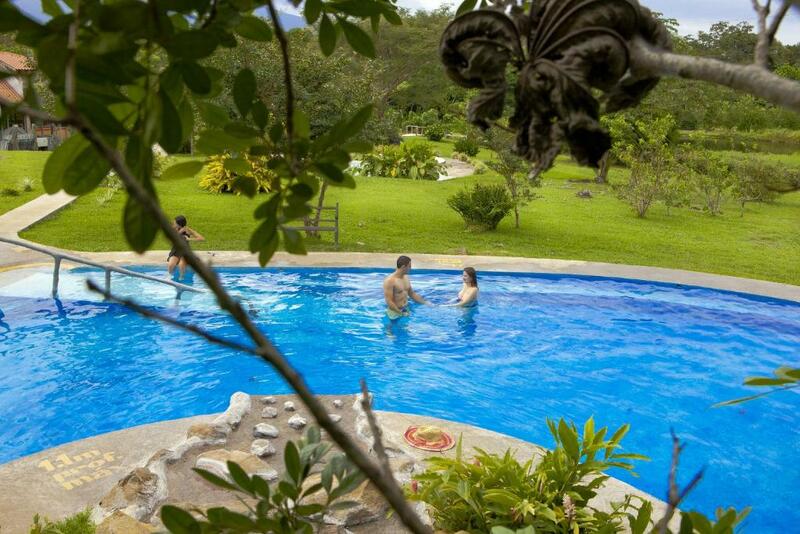 Offering an outdoor pool and an a la carte restaurant, Las Colinas del Miravalles is located in Fortuna. Free WiFi access and free private on-site parking are available. Each room here will provide you with a flat-screen cable TV, a balcony and a private bathroom with a shower and free toiletries. 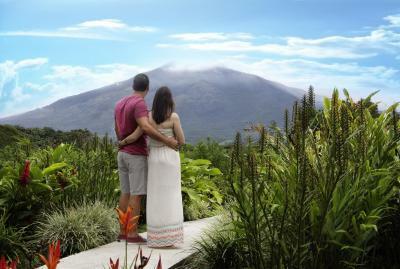 You can enjoy a view of the Miravalles Volcano from the room. At Las Colinas del Miravalles you will find a garden and a terrace. Other facilities offered at the property include a tour desk, hot springs and a fishing pond. Daniel Oduber Quirós International Airport is a 1-hour drive away. This property also has one of the top-rated locations in Hacienda Guayabo! Guests are happier about it compared to other properties in the area. 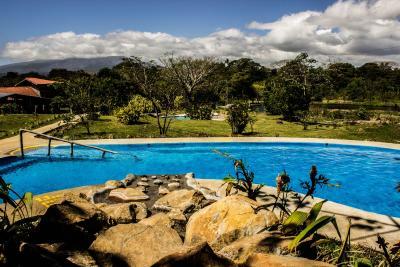 This property is also rated for the best value in Hacienda Guayabo! Guests are getting more for their money when compared to other properties in this city. When would you like to stay at Colinas del Miravalles? House Rules Colinas del Miravalles takes special requests – add in the next step! Colinas del Miravalles accepts these cards and reserves the right to temporarily hold an amount prior to arrival. Fan in cabin very loud and I had difficulty sleeping. Amazing property, fantastic staff, and incredibly unique experience. If you’re considering a trip near Miravelles, this is the spot to be! ONLY Thing that would have made us more comfortable was air conditioning. There was a pretty good breeze at night and lots of windows but the night winds made for a noisy sleep. Everything else was so good though. Really friendly and helpful staff! Lovely and well maintained garden and we enjoyed a lot the hot pools after a long hiking day! Definitely recommend this place! Very little, but we were rather surprised by the large numbers of day use clients present during the daytime hours distracting from the tranquility that prevails when they were not there. The beds were comfortable, there was a small fridge, plus table and chairs and a little patio at the front of the bungalow. 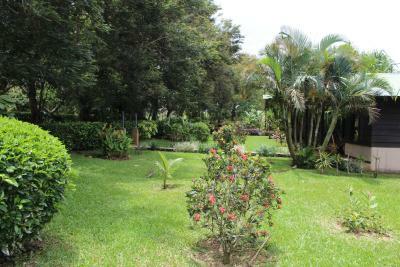 Beautiful gardens, fast WiFi, lovely pools, comfortable beds. Everything we expected, but more, because it was done with excellence. Saw some really cool birds just walking around the property. We reserved a room with two beds but the property only had a room with one bed available for the first night. They changed our cabin the next day. Bring bug spray and be ready for bugs that come into the cabin. The staff was very friendly and tried to accommodate our needs. Spoke English very well and their grounds are immaculate. As a bonus they also sell home made jams and salsas.